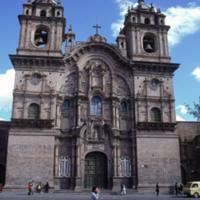 The main Jesuit church in Cuzco, La Compañía, was built atop the ancient palace of Wayna Qhapaq, who was the Sapa Inka, or head of the Inka empire. 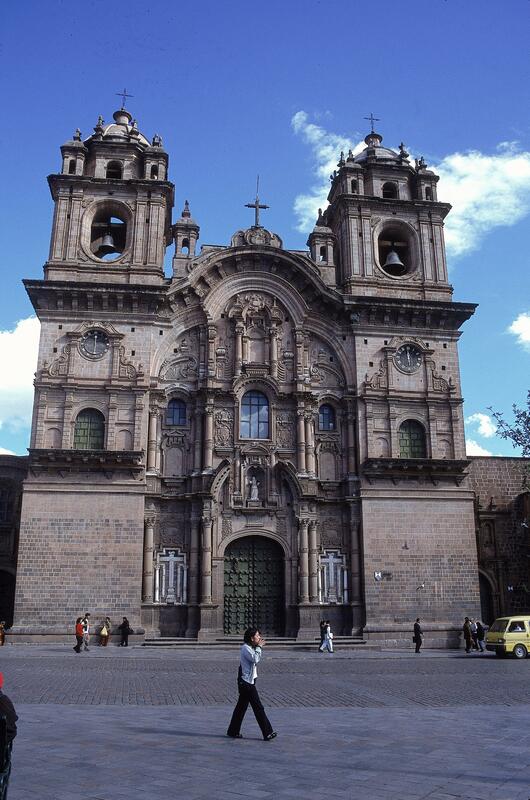 This is one of the most famous churches in Cuzco and it was, in colonial times, copied in many other structures. The vertical proportions of the whole church, where the towers are slightly greater than half the width of the façade, is echoed in the proportions of the façade itself. Its tri-lobed pediment was frequently reproduced at other churches in South America and gives the impression of upward lift. The reddish-brown color of the church comes from the stone, which may have been mined locally or taken from pre-existing Inka buildings. It does not seem to have been a color favored by Inka architects, but was very popular in colonial churches. The inside of La Compañía contains many paintings and retables (retablos). One of the most famous of these depicts the “Union of the Inka royal family with the houses of Loyola and Borgia,” another version of which can be seen inVistas. As with so many Jesuit constructions in the Cuzco region, the basic forms and design drew upon European traditions of Jesuit church architecture (and, in theory, had to have the approval of Rome). Today, neither the architect’s name nor that of the indigenous craftsmen and laborers who actually built La Compañía are known. The original Jesuit church at the site was begun in 1571. Because the Inka had created their own elaborate stone architecture, working stone was not a new idea to the indigenous masons called to this project. Yet many of the shapes and forms the church required, particularly the use of vaulting and arches, were foreign to Inka architecture. Thus the initial construction of La Compañía both drew upon pre-Hispanic practices and introduced new ideas from Europe. Cuzco was prone to earthquakes, and many of its colonial structures were destroyed in 1650 when a horrific tremor hit the city. La Compañía suffered such damage that it required rebuilding. The newly designed church, the one in this image, would serve as a model for other churches in Perú. Like many religious buildings in the former Inka capital, this Catholic structure sought to reclaim, in literal terms, sites of extraordinary political and sacred meaning for Andeans, not only by occupying the same sites, but also by reusing many of their building materials, like stone taken from earlier buildings on the site or “quarried” (which is to say, looted) from the mighty fortress of Saqsawamán, which sat nearby.